USHA presents its range of Misty storage water heaters that arent just beautiful to look at but also enery efficient and safe to use. These water geysers are equipped with best-in-class safety features such as high grade thermostat to cut of eectricity whe temperature exceeds the the set limit and advanced Earth Leaking Protection Device for safer utility. This combined with the sleek, classy design delivers style and performance in one package. Usha Misty storage water heaters are perfect for your kitchen and bathroom. Combining safety, performance aand energy saving features into a single, discreet package, Usha has been constantly innovating its product portfolio to rovide all kinds of water heating applications. 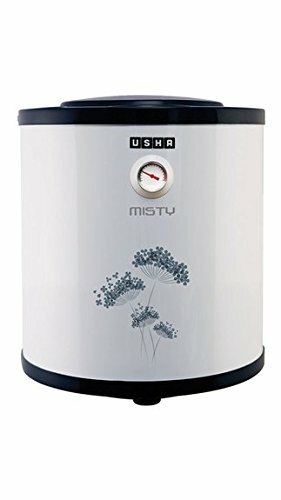 Usha Misty 5 Star Storage Water Heaters – Go Beyond the Ordinary! About Usha Water Heaters : Wide Range: The wide range of Usha water heaters are specially designed to meet a wide range of applications including use in the kitchen, shower panels, bath tubs, etc. The vibrant range gives you the freedom to choose a design that best complements the decor of your kitchen or bathroom. Safety Features: With circuit breakers, leakage protectors and safety valves all incorporated in the design, Usha Misty storage water heaters are truly best-in-breed water heating appliances. These safety features provide optimum protection against dry heating, over temperature, over pressure and various kinds of electrical leakages. The level of protection from water seepage onto the electrical part is IPX4. What's more, all Usha water geysers also unergo a rigorous testing of 250,000 pressure pulsations to ensure best performance in the field. Strong tank material makes these water heaters absolutely safe to use, even in hhigh pressure applications. Super Durability: Usha storage water heaters are made of high quality steel with te inside tank coated with Sapphire powder with glass lining treatment. This, together with a high magnesium concentrate anode rod helps the water geyser achiee super durability by protection against corrosion and electrochemical reaction. Energy Saving: High desity, thicker and polyurethane foam insulation ensures minimum energy consumption which brings down the cost of water heating substantially.